politicalbetting.com » Blog Archive » Are petrol prices driving the poll ratings? « How seriously should we take the pact call? Are petrol prices driving the poll ratings? What’ll record levels and the VAT increase going to do? One trend that’s hardly been commented upon over the holiday period has been the rising cost of filling your car up. Over the past few days the price has been edging upwards and we are now at record levels. This can have a political impact. 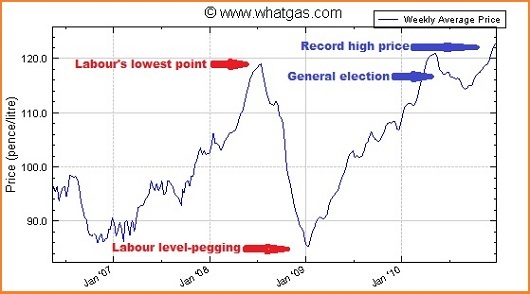 Labour’s low point in the polls in July 2008 coincided with the last high in the price of a litre of unleaded. It then dropped rapidly in the final part of that year and Labour saw a big improvement. In the immediate aftermath of the May 2010 general election prices were edging downwards. Then from July onward prices started moving upwards and this coincided with Labour’s rise. This isn’t surprising. Outside London and the big conurbations a car is almost an essential just for people to live their lives. And when the cost of running it starts to edge up it can eat into household budgets. And the latest moves come as we prepare for the new record 20% VAT rate – due to come into effect on January 4th.